I have a backlog of requests — including several shopping cart orders — that have been held up because our storage area at Indiana Freemasons Hall has been inaccessible to me due to both of the Hall’s elevators being out of commission. This situation started back in November (possibly in late October, I can’t find the emails right now) and took several months to resolve, at least partly because the elevators are in one case original to the building (1909) and in the other case a 1950’s era replacement using a refurbished car, controls, and elevator machine that had come out of a department store in downtown Indianapolis. Finding parts for both of these elevators is often an exercise in patience and near-futility — one of the elevators needed a part a couple of years ago that literally had to be cast from a special metal that almost nobody uses anymore, at least not for that purpose. The repair process was dealt a setback due to a tragic death in the building superintendent’s family at right about the same time, which took him out of state for a couple of weeks, and left the whole situation sitting, unresolved, until he was able to return. I can hardly blame him under the circumstances, and nobody else is, either. Due to the elevator problem, I was unable to get to our storage area on the fourth floor because I simply can’t climb that many stairs anymore, and certainly wasn’t in a position to climb back down with hands full of merchandise, either. So all of these requests and orders hung fire waiting on the elevator repairs. I can report that the elevators WERE repaired, finally, in late February, and were waiting for state-required inspections before they could be used by the public. Those inspections were done last week and the elevators passed, and I now have access to our storage area again. So if you are waiting for an order (and there are a couple that date from about the time the elevators went down), or had made a request either before or after that period that I have not yet fulfilled or responded to, please accept my apologies for the delay and be aware that I will be trying to get all of that backlog dealt with over the next couple of weeks. We are also planning to move TMS’s property out of the Hall and into a brand new, climate-controlled secure warehouse near my home. This will speed up my ability to handle such requests in the future (as well as cost the Society less money in rent), as over time I have spent less and less time at Freemasons’ Hall due to no longer being connected with the Masonic groups that meet there. In hindsight, we probably should have made this move several years ago, but until the beginning of 2017 I was still in the Hall on a fairly regular basis. I would like again to thank the brethren for their patience and apologize for the long wait some of you have experienced in getting your items. A few years ago I visited a lodge to attend a Masonic function. Before the meeting, I noticed the Worshipful Master sitting downstairs in a corner by himself. He looked like the weight of the world was on him. I went over to him and sat down. We began talking about life and Masonry. I then told him that he seemed troubled and asked if there was anything wrong. He said that he was frustrated because everything he tried to do in his lodge seemed to fail. He said that he had planned a lecture at one meeting with a good speaker. He publicized the meeting and began talking about it when he was Senior Warden. At the night of the lecture, there was hardly enough members present to open the lodge. He was hurt and embarrassed. At another meeting, he spoke on having a lodge barbeque. Arguments broke out among the members as to where to hold the event. One member was so angry at the venue selected that he stormed out of the lodge vowing never to return. The lodge was not very large, but it seemed split in two or three factions. Each group had their own opinions and showed no interest at all in working with the other groups. The young Brother seemed to be at his wit’s end. He said that he just felt like quitting everything. I believe that we have to realize that success and failure are subjective terms. With some lodges, it is fair to say that the Worshipful Master had a successful year simply because he was able to open the lodge for most of the meetings. The bar is higher with other lodges. But, the reality is that our goals as Masons are personal goals. Freemasonry gives us the tools with which we can improve ourselves as human beings. Our responsibility is to improve ourselves. It is not our responsibility, nor is it our right, to try to force anyone else to “improve.” This assumes that we know what is best for others. It assumes that our knowledge of their path is greater than their own knowledge of it. It also denies the other of any benefit from a change that might be forced on them. We improve by making personal decisions and finding what is right for us. We may well believe that someone is completely on the wrong path. We may believe that they are lost and in serious need of help — our help. With that belief, we interfere in their lives. But, by forcing them in a direction that we believe is right, we may be denying them the ability to learn from their own mistakes. We don’t improve ourselves, or others, by forcing unwanted interference. This goes for individuals or groups such as a lodge. Many lodges seem to have personalities of their own, not unlike people. You may find lodges that are warm and friendly with outstretched hands to visitors, others that are cold and unresponsive. Some lodges just feel and act successful with everything running like clockwork and others clearly struggling. Most importantly, some lodges openly seek assistance and others do not, at all, desire it. Lodges can be like people. With some lodges, you can quickly become friends. Other lodges just do not have the qualities that you desire. You can’t (no matter how hard you try) be good friends with everyone. It is not a failure to recognize that you are not on the same page as a person or a lodge. We all travel different paths and that is the same with lodges. The blame game helps no one. We are in a time when some lodges desire the deeper aspects of Freemasonry. They want to grow with the tools our ancient Brethren used and in the same manner as they use them. But, other lodges wish a simpler life. It is the right of everyone to choose their own path. If you are in a lodge and nothing you try works, don’t be disappointed. The lodge may simply be on a different path than you. We all have that right. Move on to another lodge that may be moving more in line with your views of Masonry. It is not disloyal. It’s not a failure. The only failure is when you remain with something that you know is wrong for you. It has come to my attention that the membership application form in the Summer 2018 issue of the Journal was printed with the wrong mailing address. Please be aware that mail sent to that address will be returned to sender. The correct mailing address for the Society is PO Box 80126, Indianapolis, IN 46280-0126. We regret the error and apologize for any inconvenience. For anyone who is wondering why I have been very silent for the last couple of weeks, particularly anyone who has recently joined or renewed but hasn’t yet received a response from me — We went on vacation two weeks ago today and I thought I had added a vacation notice to the join and renew pages like I normally do, to indicate that I would be out of the office and not processing anything until today (7/2/2018). Apparently I neglected to do that, for which my apologies. I am working through the backlog now and will be sending out cards and (to new members) patents and pins and all the stuff. If I owe you back issues, that will be handled as well. I know I have at least one order hanging in the store and that will be taken care of this week. By the way: We have a pretty extensive stock of back issues. The only ones not available are #2 and #5 (we simply don’t have any left to sell). We’d really like to move these back issues out, so if you have any interest (or want a set for your lodge, whatever), please navigate over to https://themasonicsociety.com/store and see what’s on offer. Back issues are $5 each for US and Canada ($10 each for other overseas purchasers, because even 1st Class standard flats are priced ruinously when they go anywhere but the US and Canada). Note: If you are an overseas purchaser, and you want to order a large number of back issues (we’ll say more than 5), please DO NOT use the store to order your magazines — instead, email me directly at secretary -at- themasonicsociety.com and I will work up an exact quote for you for the postage. Thanks for your patience, sorry for my forgetfulness, and thank you for being a member of The Masonic Society! The following was read on behalf of WBro. Davis at the 2018 Annual Meeting of The Masonic Society on February 9, 2018, in Alexandria, Virginia. I regret that treatment for prostate cancer prevents my attending this meeting, but I know I am leaving it in good hands. In October 2015, my predecessor, Jim Dillman, called and chaired a board retreat in St. Louis, Missouri, to set strategic goals for The Masonic Society. We were one vote short of a quorum, so the gathering was not an official board meeting, but several of us attending said that the meeting was one of the most productive we had ever participated in. At the meeting, we set three initiatives for the next two years, and distributed them to the members for online discussion. I subsequently, before taking office at Masonic Week 2016, talked with each board member separately, as well as other key members of TMS, and learned their own priorities and commitments. My own hope is that TMS Conferences will attract and serve not only Masonic leaders and researchers, as Masonic Week does so effectively, but also more and more of the many Masons who have, perhaps only recently, become interested in the history, philosophy, and symbolism of the Craft. If they attend only one national Masonic event, I hope it will be ours. But conferences are expensive, and require an extraordinary amount of planning and preparation time, so our now-available funds and volunteers may not be able to support an annual conference. Increasing our membership may allow us to continue annual conferences, but for now at least, we may be able to hold conferences only biannually. Our second initiative was a TMS School. So far, the school has offered one course, in the history and philosophy of Freemasonry, created and conducted online by Michael Poll, editor of our journal. The board has begun discussing another TMS School program, an educational tour of Masonic sites in the UK, organized by board member Greg Knott. Our third initiative was a TMS Scholar program, to offer financial support for a major project by a selected Masonic researcher, who in turn would be available to speak to lodges of research and other Masonic organizations during his or her term of service. Planning for this initiative is ongoing. And I know that many of you share my view that under Mike Poll’s editorship, The Journal of the Masonic Society continues to be Freemasonry’s leading periodical. My personal highlight during my term as president occurred a year ago, at Masonic Week 2017, when board member Greg Knott and his lodge brother Todd Creason arranged for past president Jim Dillman and me, representing TMS, to lay a wreath at the Tomb of the Unknowns, at Arlington Cemetery. We did so, in full Masonic regalia. I was especially honored to be allowed, as a veteran, to render a hand salute to our fallen heroes. In conclusion, it has been an honor for me to serve as The Masonic Society’s president during the last two years. It has been a pleasure to know and work with my brother directors and officers, as well as many other TMS members. I am very optimistic about the society’s future. Again, I’m sorry I can’t be among you tonight. But I know you’ll proceed to meet on the level, act by the plumb, and part on the square. The United Grand Lodge of England has determined to take a public stand against Anti-Masonry, after a series of articles slandering the Fraternity appeared in the Guardian newspaper last week. We reproduce here, in full, their CEO’s statement of this morning. Please feel free to share from the UGLE website and/or from their Facebook page. All Freemasons and Ladies are Welcome! The Masonic Society will not have tickets for sale. All tickets MUST be purchased in advance from the Masonic Week organizers. RESERVATIONS MUST BE MADE AND CHECKS RECEIVED BY THE MASONIC WEEK STAFF BY FEBRUARY 1, 2018. Unfortunately, we are not in a position to operate a hospitality suite this year. We know this is a popular activity and we look forward to returning to hosting a suite in 2019. Please catch us in the lobby bar or in other places around the Week. UPDATE, 21 Aug 2018: The membership application form in Issue #41 of the Journal (Summer 2018) incorrectly contains the OLD mailing address. If you are signing up by postal mail, please be sure to use the NEW mailing address, or your mail will be returned. We regret the error and apologize for any inconvenience. We also continue to receive dues payments via bank-generated checks that are addressed to the OLD address. If you pay your dues this way, please take the time to log into your bank portal and change the Payee Address for The Masonic Society accordingly. We cannot guarantee that mail sent to the old address will continue to be forwarded, as it has now been over six months since we registered the change of address with the USPS. Thank you for your cooperation in this matter. TMS was given notice this morning that our private mailbox provider is shutting down at close of business tomorrow (30 Dec 2017). So I did a bit of a dance to get new mailing address in place today. Anything that comes in to the old address starting Tuesday, January 2, 2018, will be returned to the post office (luckily, the same one where we just rented a box) and held for me to pick up, so hopefully we will not lose any mail. I picked up the mail today (29 Dec) and processed received payments from members 02366 and 02912. I will check again tomorrow (30 Dec) and pick up anything else that has been delivered by that time. After tomorrow, I will check once or twice a week at the post office for any mail returned from the 1427 W 86th St address. If mail is returned to you from the 1427 W 86th St address, please resend it to the new PO Box, or, if it was a renewal, you might consider renewing online instead. Thanks for your understanding. We certainly had no idea this was going to happen, or we would have made the change months ago. The first time I saw the changing of the guard at Arlington National Cemetery, I was five years old. We were in Washington, D.C. on a family vacation. I remember it very clearly. That solemn ceremony left a very deep impression on me. 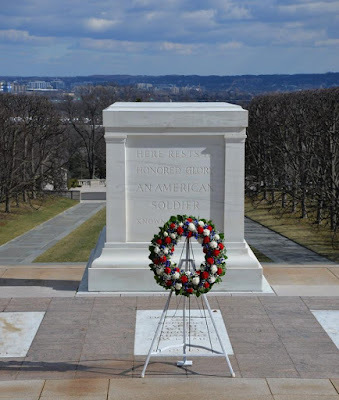 I’ve watched on television as Presidents on Memorial Day have laid the Memorial Day wreath many times, and every time, I’m struck with that same sense–a mixture of American pride, patriotism, honor, and deep respect for the sacrifices that have been made in the name of freedom. Two years ago, I saw the changing of the guard again–more than forty years later. Fellow Midnight Freemason Greg Knott and I flew to Washington D.C. for a Masonic event, and less than an hour after the plane landed at Ronald Reagan International Airport, we were standing at the Tomb of the Unknown Soldier. The Boy Scouts were there that day, and during the changing of the guard, they presented a wreath–the same exact ceremony the President takes part in on Memorial Day. We both knew what we wanted to do on our next trip out–to place a wreath on behalf of Freemasons everywhere to honor our fallen heroes. In February, we were able to do just that. Greg and I on behalf of Homer Lodge No. 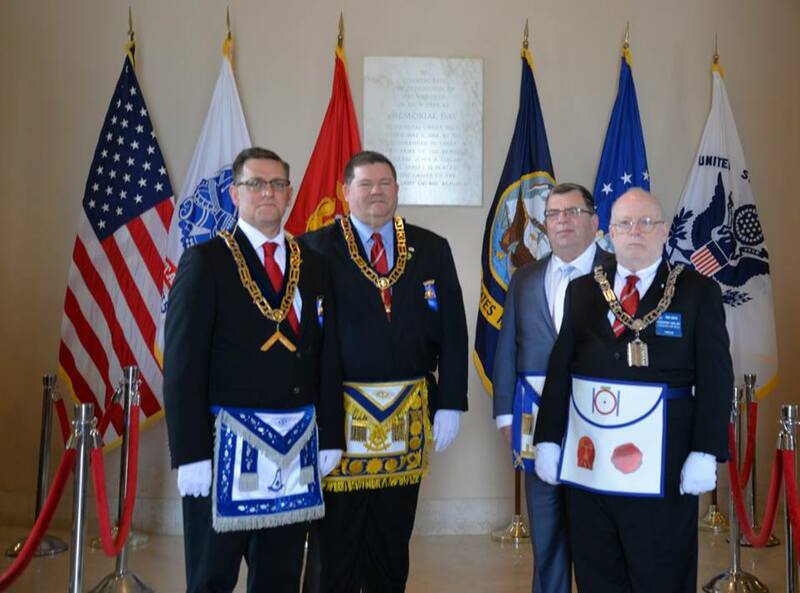 199 (IL) and with the blessing of Our Grand Master of Illinois, Anthony Cracco. We also asked the President and Past President of The Masonic Society to join us–Kenneth Davis and James Dillman were only too happy to do so. The reality didn’t really set in until I was standing at the top of the steps looking out over the Tomb of the Unknown Soldier and the cemetery beyond as the Relief Commander slowly ascended the steps before us. The wreath we provided was already in place waiting for us as we descended together in step. It was about thirty-five degrees with a thirty mile-per-hour wind, but the four of us barely felt the bracing cold. We were there to represent Freemasonry, so we left our winter jackets behind in favor of our suits, jewels, aprons, and gloves. We were about to honor our fallen veterans on behalf of Freemasons everywhere by laying a wreath at the Tomb of the Unknown Solider. Once the wreath was placed, a soldier played Taps. 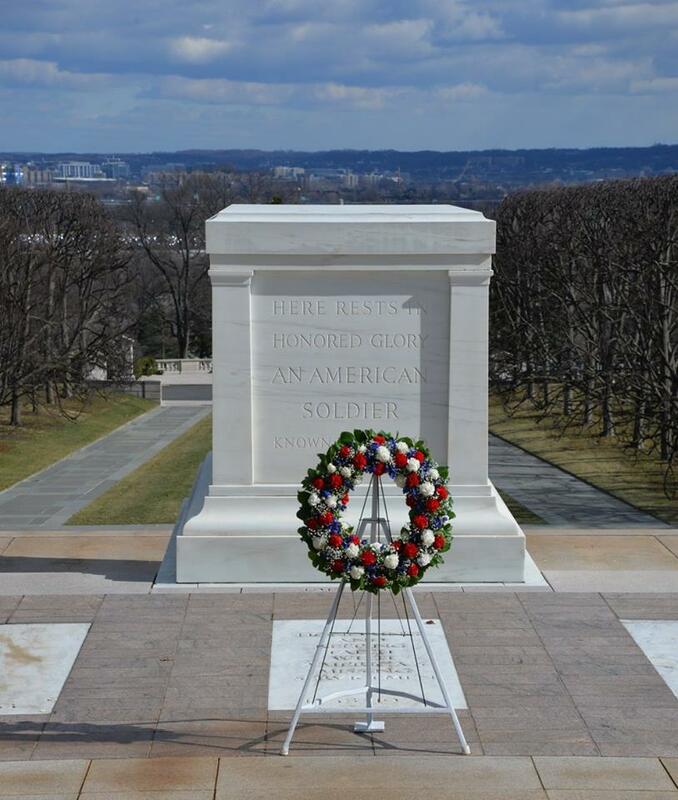 It was an indescribably moving experience listening to Taps as I fixated on words on the Tomb of the Unknown Soldier: HERE RESTS IN HONORED GLORY AN AMERICAN SOLDIER KNOWN BUT TO GOD. It was an experience I don’t think any of us will ever forget. I certainly won’t. Afterwards, we stood and watched the guard for some time. It occurred to me that there had been a guard watching the Tomb of the Unknown Soldier, 24-hours a day, seven days a week, 365 days a year, uninterrupted, since I’d been there as a five year old child. It was that important. And the honor of being able to serve in that capacity is considered one of the highest honors in military service. As we left the Tomb of the Unknown Soldier, a funeral procession was in progress–something that happens on average twenty-four times a day at Arlington National Cemetery. Greg Knott and I walked to a large tree in the center of one of the plots to get a better view. As the horse drawn cassion passed with the flag draped coffin on top, and I looked out across the cemetery at the thousands and thousands of identical stones, I was struck by the high price Americans have paid for freedom. And yet it’s a price that generation after generation of Americans have continued to pay, because in the end, there is nothing more important to who we are as the American people than those freedoms provided us under the United States Constitution. This article was originally published on The Midnight Freemasons website, and is reproduced here with WBro. Creason’s kind permission. WBro. Creason retains all rights to his article. Please contact him directly for republication permission.